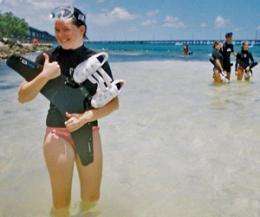 UC student Sydney Moeller tests the Lunocet fins in the Florida Keys. (PhysOrg.com) -- Ten University of Cincinnati design students recently tested prosthetic tails that hold promise in revolutionizing sea diving. That experience was part of an innovative UC studio course linking design students with entrepreneurs, and it will be the subject of a presentation at an international design conference in August. Ten students from the University of Cincinnati’s nationally number-one ranked interior design program recently returned from the Florida Keys where they tested - and provided feedback to the inventor and manufacturer of - unusual foot appendages that aid human sea divers to swim like dolphins. Then, about 24 UC design students further tested these mechanical “Flipper” fins (called Lunocets) in UC’s Olympic-sized lap pool. The mechanical foot fins could be said to transform users into something like mermen and mermaids, according to Brian Davies, associate professor in UC’s School of Architecture and Interior Design, who is leading the student testing of the products. He is doing so as part of an ongoing series of courses on design for extreme environments and as part of an experiment within UC’s internationally ranked College of Design, Architecture, Art, and Planning to link design students and classes to the needs of entrepreneurs. Davies, along with UC design graduate students Jon Lowry and Ryan Rosensweig, will present on the “Flipper" fin course, actually titled “Retail Design: Lunocet Retail Launch,” on Aug. 3, 2010, at the prestigious Industrial Designers Society of America conference in Portland, Ore. According to coverage by National Geographic Adventure, the tails - attachable to human feet for dolphin-kick swimming - help users attain speeds twice as fast as the swiftest Olympic swimmer. They are the brainchild of inventor and manufacturer Ted Ciamillo, founder and president of Ciamillo Components, Inc., in Nicholson, Ga. Ciamillo successfully designs and manufactures light and powerful aluminum bicycle brakes. He is now fine tuning his offering of Lunocet fins and turned to UC’s Davies because of Davies’ extreme environments design courses and to obtain informed feedback from design students. One design student participating in the course and Lunocet testing was Kate Schneider, 24, from Columbus, Ohio. She admits to not being an especially good swimmer. However, that very inexperience allowed her to make valuable marketing suggestions. She explained that the group product tested a hydrotour in the Florida Keys, actually strapping on the fins and taking the tour. She added that it was great to have a real-world retail client who offered immediate feedback and just as great to get to try out the retail products they were researching. Just what advantage over the traditional fins? Sometimes one needs to be able to separate the feet and traditional fins permit this. I would like to see a side by side race of these "dolphin" fins and the ones you put on each foot. "Looks delicious" stated one shark.